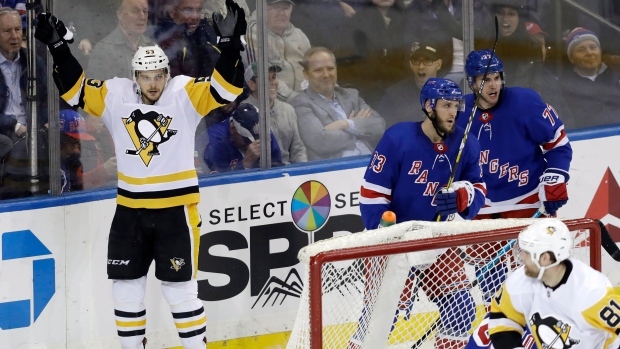 NEW YORK — The surging Pittsburgh Penguins are closing in on the top spot in their division. "I thought we didn't have a great start," Blueger said. "We know we have the firepower in here to get back in those kinds of games. We didn't get down on ourselves. We kept pushing each other." Blueger centred the second line, with Evengi Malkin out of the lineup due to an upper-body injury. "He's playing an important role for us right now, especially with Geno out of the lineup, and he's done a great job," Penguins coach Mike Sullivan said. Sullivan said after the game that Malkin, who has been out since leaving a game against St. Louis on March 16, did not skate Monday but "skated a couple of days prior to that." "One of those (games) where everyone seemed to contribute," Bjugstad said. "We're all well aware of the standings and where we're at," Sullivan said. "We weren't able to sustain all the good things we did in the first period," coach David Quinn said. "And for them to tie it so quickly seemed to deflate us. We never got back on track." "I just saw Sid go behind the net," Schultz said. "Obviously, he's got great vision. Tried to find a lane. He made a great pass. Fortunate enough for it to go in." "I saw Rusty going backdoor and so I tried to throw it to him," Blueger said. "Didn't connect that clean. I just instinctively stayed there. I tried to get it on net as quick as possible." "In the first period, we were playing our game," Georgiev said. "When we started losing, we started playing offensive hockey and the game opened up. Tonight they managed to shoot pucks really well." "It was laying there and I just whacked at it. Just get the puck to the net and stuff happens every once in a while," Bjugstad said. NOTES: Penguins defenceman Kris Letang missed the game with an upper-body injury. His status is day to day. Zach Trotman replaced him in the lineup. ... Rangers forward Jesper Fast will miss the rest of the season because of an injury. D Marc Staal was out with a lower-body injury and forward Chris Kreider is day to day after missing Saturday's win at Toronto.